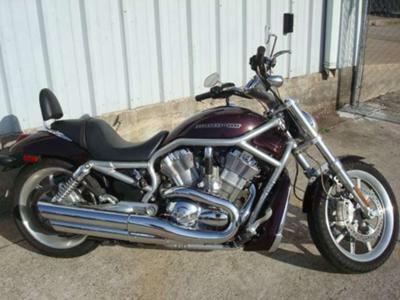 I have a Burgundy color 2006 Harley Davidson V Rod for sale that has a 1150 cc Engine. The Harley VRSC is in great condition with a few extra upgraded parts and accessories. The chrome on the used Harley motorcycle for sale is spotless and has no pitting scratching or blemishes. It is a very very clean low mileage bike with only 3k carefully driven miles. When you see it in person you will see that the bike runs, handles and drives excellently. The motorcycle is located in LA and if you are interested in make an appointment or an offer you may reach me by leaving your questions and contact information in the space below provided by Strike Lightning Used Motorcycles for Sale and I will get back with you as soon as possible. Strike Lightning would also encourage bikers to submit a review of the 2006 Harley Davidson V ROD for sale to help potential buyers make informed decisions and to benefit the biker community as a whole.